8 April 2019 – Doha, Qatar: Hakkasan Doha, a modern interpretation of authentic Cantonese cuisine, is launching a new menu with a mix of elevated signature items, and new dishes, some of which will be exclusively offered at Hakkasan Doha this season. Hakkasan is modernizing some dishes but these will still remain true to the roots of Cantonese cooking. These include various dim sum platters such as the much sought-after Vegetarian dim sum, the Supreme steamed dim sum which has been revamped to offer four different dumplings consisting of Gold leaf lychee and lobster, Scallop shumai with caviar, Royal king crab jade dumpling, and the Seabass dumpling with black truffle. Another highlight of the menu is the Hakka fried dim sum platter, Jasmine tea smoked Wagyu beef ribs, which are marinated, then smoked with Jasmine tea to add an extra smoky flavor to the tender and sweet meat. A new level of sophistication is evident in the signature dishes that will remain on the menu with a slightly adapted presentation, while retaining the Cantonese flavours. These include; the Crispy duck salad and Grilled Chilean seabass with honey, the world-famous Stir-fry rib eye beef with black pepper balanced with a touch of sweetness. 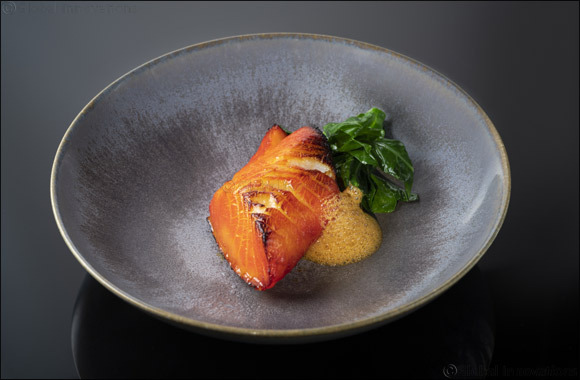 As for debuting dishes, the Hakkasan team announces the Braised Wagyu short rib in Szechuan sesame sauce along with an Osmanthus Wagyu beef rib-eye, and Wok-fry chili Alaskan king crab with saut�ed scallop and salted olive. Hakkasan is also adding an Olive seafood fried rice featuring ingredients such as prawns, scallops, olives, and asparagus promising a rich seafood flavor. Additionally, the new menu will also present a Spicy red snapper fish with flavorful kaffir chili sauce dish, and a Wok sear grouper in superior ginger soya; a light and spiced up delight. Additionally, Hakkasan guests can also savour novel desserts including; Jade delice, a mango vinegar Pate de fruit offering a combination of flavours including mango and pandun, a chocolate lover’s dream in the form of a Hazelnut and milk chocolate parfait, and finally, the Bitter sweet temptation, a raspberry and jasmine mousse. Situated in the luxurious grounds of The St. Regis Doha hotel, Hakkasan offers exclusive dining areas, with indoor seating and an outdoor terrace as well as a private dining room and secluded bar, and the Ling Ling lounge.